Future astronauts returning to the moon will likely need a network of satellites in lunar orbit to aid daily operations. Communicatingeffectively with astronauts on the moon was an essential part of the Apollomissions. Without reliable radio contact there would have been no live feed ofArmstrong?s first steps and in all likelihood no first steps at all. Accordingto new research, the next footsteps on the lunar surface could be beamed backto Earth via the moon?s very own network of communication satellites. The setupcould double as a GPS for moonwalkers. "Whatwe did in the Apollo missions will not be enough," said Keric Hill ofTexas A&M University. "We will need some kind of communication relaysystem to ensure 24/7 coverage of the moon." Withoutit, interesting areas for exploration such as thelunar poles, which may harbor water ice in permanently shadowed regions, willremain out of reach. Themoon?s far side is also currently inaccessible without a relay satellite, forit is the ultimate radio dead spot; the only place in our solar system thatnever faces Earth. Gettingradio signals to these hard-to-reach places is going to require a go-betweenthat can cope with the constant gravitational nudges from the Earth, moon andsun. Onepotential path a lunar communication satellite (com-sat) could take is byfollowing a ?frozen orbit" around the moon. In such an orbit the satellite?sorbital characteristics remain constant despite prods from the moon?slumpy gravity field. Thisuneven gravity field is due to mascons, large concentrations of mass in thelunar crust. "Youcan think of it [a frozen orbit] as a roller coaster ride over the lunarmascons. If you pick the path just right, the tugs and pulls of the masconswill end up cancelling each other out. At the end, the spacecraft will be rightback where it started in the orbit," Hill told SPACE.com. Analternative to the bumpy ride of the frozen orbit is to place a com-sat in ahalo orbit around a region known as a Lagrange point. Thereare five Lagrangepoints in the Earth-moon system marking the region where a spacecraft canremain stationary relative to the Earth and moon. "Ahalo orbit at L2 [the Lagrange point above the lunar far side] would be anideal location for a lunar communication relay, since a spacecraft therecould always see the far side of the moon. Some halo orbits are largeenough that a spacecraft would always be out from behind the moon and ableto see the Earth," Hill said. Althoughsuch a halo orbit would be a boon for communication with the lunar far side, itcan be a delicate affair and any spacecraft in such an orbit would be teeteringprecariously atop a gravitational high spot. "Theseunstable equilibrium points are kind of like positioning a marble at the top ofa hill. With just a slight push, you can send it rolling down in manydifferent directions," Hill said. Withonly a small nudge from its thrusters a com-sat could keep itself on thecorrect halo orbit, or be sent back to Earth or toward the moon. Spacecraft canalso enter such halo orbits just as easily as leaving them. Infact, research by Jeff Parker at the University of Colorado has found that ittakes less fuel for a satellite to enter a L2 halo orbit than it takes to get asatellite from Earth into geostationary orbit a mere 22,000 miles (35,405 km) aboveour planet. Furthercost savings would come from a technique peculiar to spacecraft at the L1 andL2 Lagrange points known as Liaison Navigation; whereby a spacecraft in a haloorbit times how long it takes for a pulse sent to another craft to be returned.From this timing the range between the satellites can be deduced and both craftcan be located in space. "Thatmeans that a constellation of spacecraft at the moon can navigate autonomouslyas long as one of them is in a halo orbit. This would reduce the costof operating the constellation," Hill said. Aswell as providing contact with Earth, a constellation of halo orbitingsatellites would give future moon walkers a degree of independence and theyneed not rely on mission control to tell them their exact whereabouts onthe lunar surface. "Thelunar Com-Sats could provide something similar to GPS for lunarexplorers," Hill explains. "Receivers for any orbital LunarPositioning System would probably be more complicated than the GPSreceivers we use on Earth." OurEarthly GPS system relies on four or more satellites in geostationary orbit toconfirm our location, something that will likely not be cost effective out atthe moon. 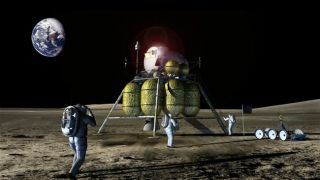 "Whatwe are more likely to see is that lunar explorers will have only one or twolunar Com-Sats visible at a time, so the explorers will probably need to havetheir own atomic clocks and wait for a while before they get a good positionfix," Hill said.